← Building a Tiny House – Welcome to my Future Home! Special thanks to Randolph Langenbach who sent me this information on rebuilding rural stone houses in earthquake zones with gabion bands. The basic concept uses ring beams of stones wrapped in strong mesh to tie the masonry walls together. “This idea for the use of galvanized welded wire mesh was conceived of in response to the April 25th Gorkha, Nepal Earthquake. The idea came to my mind and was first published only three weeks after the earthquake in response to the news reports and images showing what had proven to be an extremely vulnerable traditional form of masonry construction in rural Nepal. It is based on research on the history and effectiveness of the use of timber lacing in bearing – wall masonry construction in Kashmir and other parts of the world. These systems have repeatedly proven to be effective in reducing the risk of collapse in both historical and recent earthquakes. Here is the online report for rebuilding with gabion bands. 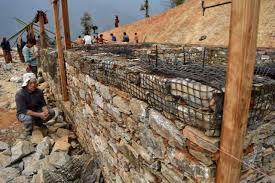 Owen: Gabion banding and earthbag building seem like the most promising solutions at this point for rebuilding Nepal. Gabion banding seems most appropriate at very high elevation where clay and wood is not available, only stone. Advantages include locals already know how to build with stone, and the building material is already on the building site. Other solutions that have been proposed are more complicated and costly and/or people in Nepal have shown little or no interest. Houses in remote rural areas have to be super simple and made with just a few local materials. One has to tour these places to really understand how difficult it is to build under these conditions. Some villages are 1-2 weeks walk from the nearest road! It’s hard for many villagers to collect even a few small diameter twisted poles for the roof, let alone any sawn lumber. (Sawn lumber is sky high in price in Nepal.) This point of super simple construction using local materials needs to be hammered home over and over if proposed designs have any hope of being utilized. In addition, I encourage starting with small core designs that can be expanded later. Also note – what do you do with all the building stone from collapsed houses? Most villagers only have a tiny plot of land and the rubble and building stone takes up a lot of space. One problem though is most villagers are terrified of rebuilding with stone for fear of another collapse. So right now earthbag is more popular in rural areas where clayey subsoil is available. Also, earthbag is now the preferred choice among NGOs working in the region. Dear Sir I have a question. Did you calculate the how much lateral load resist this gabion band if we use alternation of RCC seismic band? Contact Randolph Langenbach the architect.